The Office of Career & Alumni Services aspires to create a supportive environment that facilitates professional growth by providing job search strategies, individualized guidance, and career programming geared towards students securing successful futures through intentional choices. The Public Policy Handbook lists internships and fellowships outside of Missouri. For more resources, see the "Job & Internship Search Resources" tab below. The Truman School of Public Affairs offers current MPA students travel funding of up to $250 per year, contingent on available funding. These awards provide travel funds for graduate students, in good standing, who are attending professional conferences. For more information on how to apply, please see the box below. 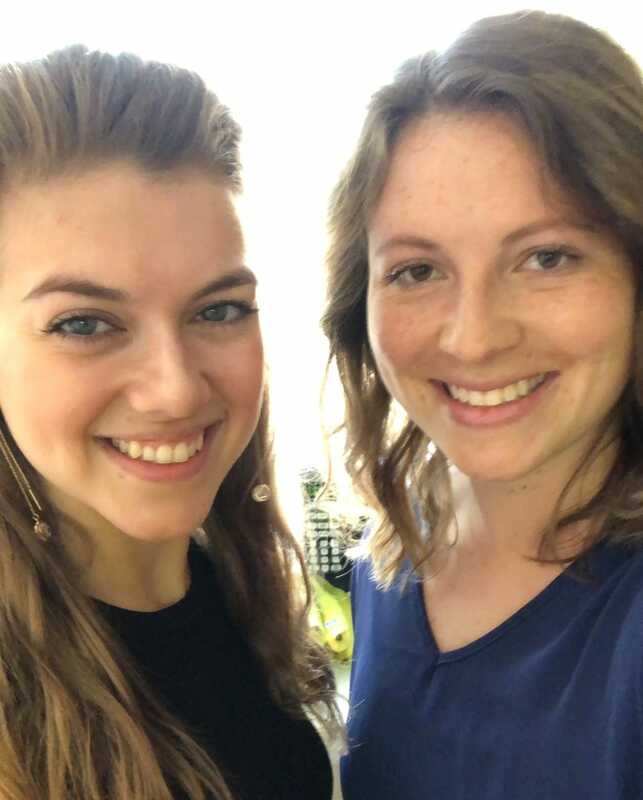 Olivia Piontek (left) and Chaley Kirkpatrick (right) in Washington, D.C. Olivia interned at the Urban Institute and Chaley at the Center for American Progress. Intern supervisors serve as mentors, meet regularly with the intern, provide feedback and present an evaluation of performance to the internship coordinators at the end of the internship. Students must complete 360 hours, which typically takes about 12 weeks. Full-time students usually complete an internship during the summer semester, although part-time placements during the academic year are allowed with approval by the internship program administrator. Students can accept a paid or non-paid internships, and these details should be discussed directly between the host organization and the intern. Students enroll in Public Affairs 8280 (3 credit hours) during the semester they will complete their internship. At the end of their internships, students complete a report and present a poster about their experience. Talk to second-year students. They have a wealth of experience, which can help you identify and land a good internship. Attend the Poster Presentations of last year’s interns to learn more about their experiences. Utilize the Office of Career & Alumni Services. The office can assist you with contact information for organizations that you find interesting. The Public Policy Handbook also lists many internship opportunities. Start looking early. Narrow your search by the winter break and begin applying in January. If you’re looking at internships outside Missouri, in Washington, D.C. or overseas, start around October. Most students accept their internship between late February and early April. In the capstone course (PUB_AF 8211), students complete an applied research project that builds upon the knowledge and skills developed throughout the MPA program. Demonstrate their capacity to apply knowledge gained through research to develop alternative solutions to a problem, evaluate their effectiveness, and make recommendations to decision makers. This capstone team surveyed low-income residents to identify the most significant barriers to safe and affordable housing in our community. The results of this survey will be used by the city to prioritize use of Housing and Urban Development funds. The capstone team analyzed the recruitment, development and engagement of the board of directors to recommend strategies to invigorate the board and increase involvement of its members. Using Department of Corrections data on the employment status of recently released inmates, this team conducted an evaluation of the vocational training program. Their objective was to determine whether or not inmate completion of a Department of Corrections sponsored vocational training program led to higher rates of employment compared to prisoners who did not complete vocational training. The capstone experience in the MPA program, PA 8211, is not required for students enrolled in the Global Management or Mid-Career options. In addition to the Public Policy Handbook for internships and the general job posting boards (Monster, Indeed, etc.) there are several good resources for exploring internship and job opportunities more focused on the public service arena. Though by no means an exhaustive list of resources, here are a few ideas to get you started on your internship/job search. If you are interested in working for the federal government, make sure to create a profile on USAJOBS where you can make your résumé visible to recruiters. You can save jobs, save and automate job searches, and manage your application documents. You should not use your standard one or two-page résumé to apply for federal jobs. USAJOBS has tips for completing a federal résumé at https://www.usajobs.gov/Help/faq/application/documents/resume/what-to-include/ or you can contact the Career Services office for assistance. Most states have a job application portal accessible from their main website (which is the two letter state abbreviation-dot-gov, e.g., mo.gov). From here, you will likely find an application portal for state government jobs. Each state website is structured differently, so you may have to do some digging. Keep in mind, these state sites may host jobs only for a state’s executive branch agencies. Separately elected officials, independent agencies, universities, the judicial and legislative branches, and other state-level agencies may host their own job sites. The official U.S. Government website usa.gov also has a wealth of information about states and territories. In addition to accessing the website of a particular city to search for jobs, most states have a state municipal league. These websites for these organizations often host a job-posting service for their members. The National League of Cities has a directory of state municipal leagues with hotlinks to each league’s website. GoinGlobal helps job and internship seekers find opportunities both at home and abroad. The site includes professional organizations, links to job posting sites and cultural norms/expectations concerning the job search and the working environment. Going Global also features profiles/guides on many U.S. cities. The U.S. Agency for International Development (USAID) focuses on administering civilian foreign aid and ending extreme global poverty. Idealist is one of the most popular resources for finding opportunities in the nonprofit sector – internships, jobs and volunteer. If you are interested in the Kansas City area, Nonprofit Connect is a regional association serving more than 5,000 professional members from over 700 organizations representing local, regional and national nonprofits of all sizes as well as community-minded businesses and foundations. They host a regional nonprofit job board. If you are interested in nonprofits in the St. Louis area, the new Rome Group non-profit career board allows for the creation of custom email job alert messages. You can create alerts based on your personal job preferences and search criteria. You can manage and add alerts to your account at any time. LinkedIn. More and more employers are using LinkedIn to advertise jobs and recruit. Make sure to polish up your LinkedIn profile. If you would like assistance or feedback on how you might improve your profile, contact the Career Services office. Daybook bills itself as the “leading job search resource for political, policy and non-profit professionals.” Access to some postings is free, but full use of the site requires a subscription (currently $5/month). You can filter by location, job focus and position type (internship, entry level, mid-level, senior level). Professional organizations often host a job-posting service for members and also provide a number of opportunities for networking. Three of the most prominent organizations in the public service field – NASPAA, APPAM and ASPA – sponsor PublicServiceCareers.org, a website for finding jobs, career advice and information on degrees in public service and public affairs. Have you found a great resource you would like to share? Pass it along to Leanne Tippett Mosby at tippettmosbyl@missouri.edu and we can expand our list! Students must develop their own Application Packet. Applications must not exceed two pages and must be received a minimum of 4 weeks prior to the event. Awards will be made on an ongoing basis until the annual budget has been expended. Brief description of the Conference and why you would like to attend. In what way(s) will your planned travel experience deepen your understanding of a specific interest area or assist you in your career development. Submit completed proposals to Leanne Tippett Mosby via email at tippettmosbyl@missouri.edu. Please note we will limit student applications for a particular conference and will provide funding to an individual student only once per fiscal year. What contacts were made and how might they influence your research/policy interest, your future graduate education, and/or career opportunities? In what way(s) did your recent travel experience further your interdisciplinary understanding of your area of study? Describe any potential opportunities that may arise due to your attendance. What new research or ideas did you learn about and how might it impact your current or career direction? Thank you for considering students at the Truman School of Public Affairs to meet your hiring needs. To reach targeted candidates with the skillset you seek, we offer several platforms to enhance your recruiting efforts. The Harry S Truman School of Public Affairs is part of the College of Arts & Science. The College of Arts & Science and the College of Agriculture, Food and Natural Resources hold a joint career fair in the spring and fall. The next career fair will be on Wednesday, September 25, 2019 from noon until 4pm in the Mizzou Rec Center/Historic Brewer Courts area. The fair is well-attended by a wide variety of students representing a multitude of disciplines. Employers and students can register for this event through Handshake. On-campus interviews help employers identify candidates early, access diverse applicants, meet faculty and staff, and increase visibility. We can also set up a brown bag lunch or morning session with Truman School students to learn more about your organization. The Truman School adheres to the campus standards and uses the same policies as the MU Career Center. Please access the general information, professional conduct, disclaimer, job posting information, and employer access information here.